When their bathtub starts to get dingy and old, homeowners tend to consider ripping out their old tub in exchange for the installation of a new one. While a new tub can be purchased for as little as $300 at your local home improvement store, bathtub replacement can easily run you thousands of dollars when you consider the cost of time and labor involved with the process. You’ll need someone to dismantle your plumbing, figure out a way to remove your bathtub and ensure your new tub fits perfectly. That can be tricky, time-consuming, frustrating and very expensive. Instead of replacing your bathtub, why not reglaze it? Reglazing is convenient, cost-effective and doesn’t take much time.Reglazed bathtubs provide the best of both worlds. You get a clean, beautiful tub finish that looks like new without spending large amounts of time or money to do so. 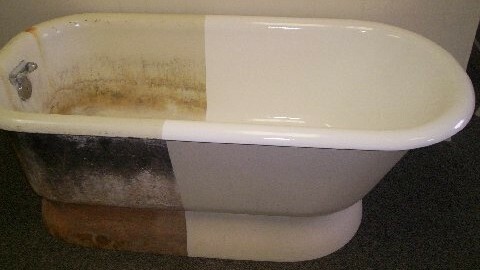 Most reglazing projects for bathtubs take about a day to complete, and usually average $300-$500. You won’t have to deal with plumbing complications or worry about properly disposing your old tub, which can be an added cost as well.Here are some tips to help you prepare your surface for reglazing. Strip your tub bare. Anything that would hinder your project by making contact with the tub or falling into it has to go. This means you should remove all your hygiene products (soaps, shampoos, razors, etc.) and bath decorations from the area. You shouldn’t even leave your shower curtain hanging because it’s an obstruction to the workflow. If your bathroom has wallpaper, inform your contractor, because wallpaper is sensitive to their normal masking tape and they’ll have to swap it out for tape that’s compatible with your wallpaper. Making sure that your bathtub’s surface is clean of debris, dirt, and oil is of utmost importance in preparation. While you may not expect to completely remove stains that are etched in your tub, you do want to perform a thorough job of cleaning all oils, scraping soap scum, dirt and silicone materials from the tub’s surface. This has to be done in order to ensure the reglazing materials will adhere to the surface.Please pay very close attention to the area around your drain. Scrape this area closely and thoroughly. It’s very common for homeowners to overlook the buildup around their drains; as a result, this area is failure-prone. We recommend that you use Barkeeper’s Friend and a scouring pad as they’re proven to be helpful as you scrub and scour your tub of any oils and soap scum.After you’ve scraped, scrubbed and rinsed, perform a final inspection. You want to triple check for any hints of debris or residue. We can’t stress the importance of removing as much soap scum, caulk, or silicone contaminants as possible. Clean anything you might have missed. Wipe your tub dry with paper towels. Your bathtub isn’t the only thing in your house that’s subject to potential reglazing. You can reglaze your bathroom sink, kitchen sink, and even your kitchen countertops. Kitchen countertops and sinks are popular choices for reglazing projects because your kitchen is the “heart” of your home.When preparing your kitchen counters or sinks to be reglazed, the steps are much the same as what you’d do for your bathtub. You want to clear the work area(s) of obstructions, including cookware, bakeware and decor. Once your pot, pans and decorative elements are removed, you want to thoroughly clean to remove dirt, debris, oils and any contaminants that prevent the job from adhering.Always pay close attention to the drain in your kitchen sink. Thoroughly scrub and scour with Barkeeper’s Friend and a scouring pad, then rinse and wipe the surfaces dry using paper towels.Remember, getting your surfaces reglazed doesn’t have to be a big deal. You simply have to make a decision to save yourself the time and money, and invest a little elbow grease in providing a clean surface that’s ready for action.